I was thinking that it would be appropriate to get a picture of a robin, since they've returned in droves. Because it was raining today, I was going to pass on the challenge, but chance presented me with the perfect opportunity. 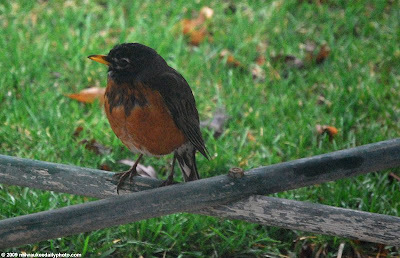 This robin was sitting on our patio underneath a set of washtubs we use as a makeshift cooler in the summer. He was sitting up on the frame off the ground, and he and a partner were waiting for worms to crawl from the wet ground on to the slab, and dining on the worms. Clever birds, for sure.